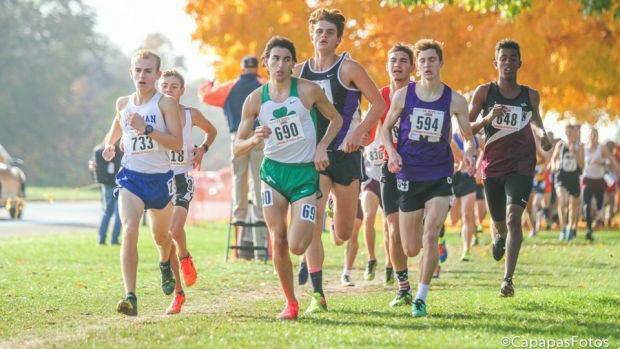 Going into the year the 1A Boys race was filled with question marks. For the first time since 2013, there was not have a returning runner that did not run 14:30 the year prior. The speculation for most of the year is that the fight for first would be between seniors Christopher Collet of Seneca and Garrett Dixon of Monticello. Dixon and Collett along with Negus Bogard (Jr., Robinson), Noah Smith (Sr., El Paso-Gridley), Colby Johnson (Jr., Dee-Mack), and a few others went through a conservative first mile between 4:52-55. It did not appear as though the fans would see a sub 14:55 performance if they continued a tactical race for much longer. Dixon and Collet separated from everyone else but they continued a tactical race through the second mile running a 5:00 split and passing the two-mile checkpoint in 9:50. Dixon tried to make his move just past the two-mile marker throwing in a huge surge, but Collet stalked him down and made his move a little after the 2.5 marker. At that point, Collet was about two seconds behind Dixon, but the race was far from over. Collet, as it turned out, had a ton of petrol left in his tank and put in a strong surge of his own. As Collet passed Dixon there was no response. The end result was a rousing win in a personal best 14:45- 11 seconds better than Dixon's 14:56. Bogard held on for third in 15:06. Senior Jackson Stewart of Decatur (St. Teresa) took fourth in 15:07. Junior Dawson Smith of Rock Falls held on strong against several foes to close out the top five in 15:10. Afterward, a jubilant Collet is looking forward to the track season and a goal of winning the 1600 and 3200 which would complete a distance triple crown. The battle for the three-team trophies had a different outcome than some expected. #1 Clifton Central was the favorite to walk away with the team title, but many thought it would be a close battle between them and #2 Monticello. Unfortunately, the Sages had to settle for third. That wasn't the case with the Comets easily defeating the Owls by 50 points. They were amazing with their runners placing 13th, 16th, 33rd, 66th, 77th, 136th, and 142nd. Besides a few changes here and there the team battle ended almost exactly how most thought it would end. #3 Elmwood earned themselves another title taking second .